Moments are fleeting and photographs last forever serving as visual memories. Looking through old photos of my family doing the day-to-day ordinary things fills me up with love and gratitude. Showing us how we were living and what life felt like. I want to capture the feeling of childhood, family, love, and LIFE through my lens. Not just for my family, but for your family! Documenting your life through photographs is the best gift you can give to yourself and your family. From a simple portrait to documenting real life at home. Find the right type of session that fits what you truly want, and how you want to remember your family! I like to prepare my clients before any session with me. So often people are so nerve racked about photos. I am a pretty laid back person as it is, so I typically like to keep my sessions relaxed and fun. So....have fun and be yourself! It's only natural to feel nervous or weird in front of the camera. For a lot of us anyway. But the more you relax and enjoy the time in this beautiful location with your family, the more moving and beautiful your images will be. I will guide you and direct you, but the more that you can be open and relaxed will create better images. I typically like to choose a location(s) that has meaning to you and make it about your family's personality. Places that would really mark this time in your life. If you love the vibe of the city, there are tons of interesting buildings, textures, streets, neighborhoods and even alleyways to explore. If nature is more of your thing, there are many beautiful natural locations that have more to offer than your standard city or suburban park. I want you to feel comfortable, relaxed, and completely in your element. Using locations that really represent you will end up producing images that feel authentic and will remain special to you in the years to come. I am happy to help you brainstorm ideas and come up with suggestions for you! Sometimes the unexpected can make for the best moments. If your little one is throwing a tantrum, just go with it. This is real life, and I love capturing the real, raw moments. The worst thing is to let yourself get upset. Nothing can sour a photo session more than parents yelling at their kids. Just let them be themselves and don't try to force them to act happy. I guarantee its not as bad as you think it is. I will offer different fun things to try with the little ones to make it fun for them again. But keep in mind to relax and go with it. In-Home Lifestyle sessions are a unique way to capture everyday life in a beautiful way. Typically an In-Home Lifestyle session will take place in your own home, backyard, neighborhood, or even neighborhood park. The idea of this kind of session is to capture the unscripted moments, so there is little to no posing and work best when centered around an activity that your family loves! This could be something as simple as bath-time, playing dress up, having a backyard picnic, making cookies, or reading books together. 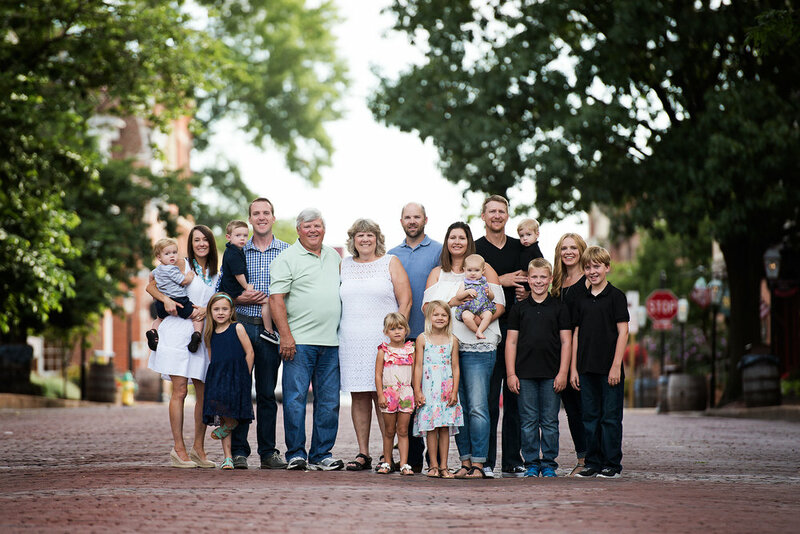 Extended Family sessions are typically really fun with a lot of jokes and laughter. I will do a few different big group shots, then break off with Mom + Dad with the adult kids, then the adult siblings, then just the cousins, and just whatever other combination you would like, plus individual families together. There will also be a lot of in-between moments captured as well. The kids and adults playing together is encouraged! The more interaction, the better! Extended Family sessions can take place either at the home everyone grew up in or a scenic location and are scheduled for a time of day when the light is ideal. *pricing can vary with the amount of people in your family.